Quick trivia question: Which is the most popular sleep position? You’re right if you said sleeping on the side. Sixty-one percent of Americans are side sleepers. And this is good because side sleeping helps reduce snoring (more on this later though). But, like any other sleep position, side sleeping has some drawbacks (luckily, it’s nothing so severe that you can’t fix it with the right pillow). We’ll show you some of the best pillows for side sleepers. But first, let’s learn how sleeping on the side helps reduce snoring, which side (right or left) is better for you, and drawbacks of side sleeping. Snoring is more than a noisy nuisance; it is linked to several health problems, none more serious than sleep apnea, a disorder in which breathing pauses frequently during sleep, from a few seconds to a couple of minutes at one time. Stroke – According to a health study, louder and longer the snoring, the greater the long-term risk to stroke. Protect yourself by getting help for snoring . Heart disease – People with sleep apnea are two times more likely to suffer from both nonfatal cardiovascular events and fatal heart attacks. The good news is that after a successful treatment of sleep apnea your risk to heart disease is no greater than the risk of people without sleep apnea. GERD – Sleep apnea and GERD almost go hand in hand, with most GERD patients reporting worsening of symptoms in night. Relief from sleep apnea is believed to help reduce GERD. The writing is on the wall if you're a habitual snorer. Luckily, huge changes are not required to reduce the risk to snoring and sleep apnea. Side sleeping ameliorates sleep apnea by preventing the base of the tongue from collapsing into the back of throat, which is what causes snoring in the first place. Which side is better—right or left? Sleeping on either side is equally effective in ​reducing snoring​. However, in certain situations it is advantageous to sleep on the left side than the right. Pregnancy – Left-sided sleeping is often recommended during pregnancy, especially during the later trimesters, and not without good reasons. Left-sided sleeping ensures the uterus doesn’t apply pressure to the liver during sleep; is good for blood circulation; improves the flow of the blood to the fetus, uterus, and kidneys; and prevents pregnancy-related back pain by taking pressure off the back. GERD – Left-sided sleeping is good for those who experience heartburn (the most common symptom of GERD) according to a study published in The Journal of Clinical Gastroenterology. In the study, researchers found that participants who lay on the left side experienced more relief from heartburn than those who lay on their right side. Many people who sleep on their sides feel some constriction in the neck and shoulder region, especially after waking up. This happens because the shoulder bears most of the bodyweight while you sleep. Another drawback is that the blood flow to your arms is restricted in this position. This in turn has an adverse affect on your nerves and muscles. Sleeping on one side can also lead to pain in the hip of that side. The reason is pretty simple: throughout your sleep, or for a greater part of it, one side of the hip is bearing your body weight. What’s the solution (especially if I don’t want to change your sleeping position)? Tip#1: Use a firm and thick pillow under the head. This is probably the most important piece of advice for side sleepers who complain of a stiff neck in the morning. In comparison to stomach or back sleepers, side sleepers need a firmer, fuller pillow, and understandably so. When you sleep on your side, there is more space to fill between your head and the head. If the pillow is too thin or soft, your head will be positioned too low, which will cause or aggravate neck pain. There’s an important tip here: Do not choose a pillow that is too thick because then your neck will be bend upwards, which is just as bad as the neck bend downwards. Tip#2: Put a firm pillow between the knees. If you experience pain on one of your hips and/or lower back, try placing a firm pillow between the knees. A pillow here will take pressure off your hips and lower back, providing relief from pain. You may have to experiment a bit before you find the right pillow. However, do not discard a pillow after using it for a day. The body takes some time to get adjusted to a pillow prop, so give every pillow you try a fair run—no less than of seven days. Write down how your hip and back feels. If some pain is still there, use a pillow of a different thickness. This Snuggle-Pedic pillow seems to do important things right. It is firm, comfortable, and perfectly conforms to your neck and head. As a result you get great support during sleep—something every side sleeper with neck or shoulder pain wants. The other great thing is its micro vented foam. It ensures sufficient ventilation, meaning you won’t feel unduly warm under your head. Those who are hypersensitive to allergens will also like this pillow because it hypoallergenic and dust mite resistant. If you are a side sleeper looking for a firm, comfortable pillow that provides proper orthopedic support, you might want to give this Snuggle-Pedic pillow a serious consideration. Oh, and did we mention that this pillow smells so lightly that you can use it right out the package? Yes, that’s right; you can start using it the moment it arrives. You really cant go wrong with this pillow. As with any pillow, it is recommended that you sleep on it for a few weeks to allow it to confirm to your shape. Too thin or thick a pillow is a side sleeper’s nightmare. Well, you are not likely to worry about improper support or height if you use the Cool Bamboo Shredded Memory Foam Pillow—and that’s its biggest advantage. 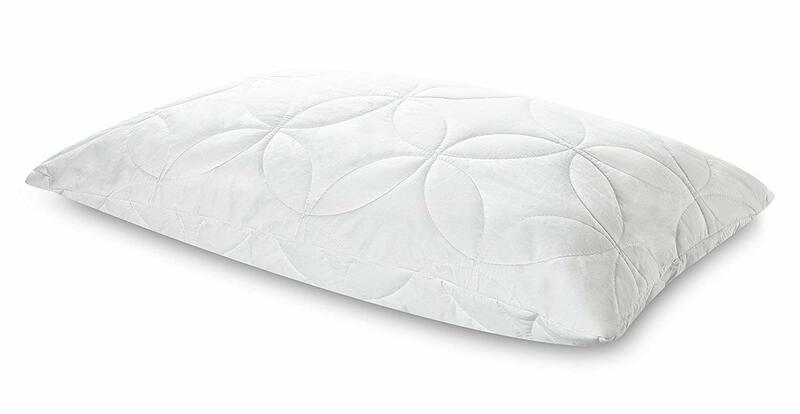 Thanks to small pieces of memory foam (hence the name shredded memory foam pillow, if you were wondering), the pillow can be thinned out or fluffed up as needed. The cover is a 50% Bamboo and Polyester blend, a material that keeps you cooler as you sleep, ensuring a good night’s sleep. The 5-year warranty against going flat and its hypoallergenic and dust mite resistant qualities are other strong points of this Cool Bamboo pillow. However, its strong smell when new is a letdown. You may have to air the pillow for a couple of days or wash it in a machine before using it. This memory pillow from Coop Home Goods uses a trademarked bamboo polyester blend fabric which effectively regulates the temperature of the body of the pillow, ensuring that it feels warm when the temperature is low and cool when the temperature is on the higher side. Another plus point is that it allows better air circulation than pillows made with standard foam. As the pillow uses the shredded memory foam, you can adjust it to your perfect position by fluffing it up or thinning it out. This shredded memory pillow is hypoallergenic as well as dust mite resistant, and hence is suitable for those sensitive to allergies. One thing that you won’t like about it, however, is its strong smell when you first open it. You probably will need to throw it in the washing machine to wash off the smell. After drying, leave the pillow for 2-3 days to allow the foam to settle to its previous density. Resembling a plush brick, the Beyond Down Gel Fiber Side Sleeper Pillow provides the extra support for side sleepers, thanks to its 4.5 inch gusset. The pillow is not too firm yet provides excellent support to the neck. The other main advantages of this pillow are that it’s (1) machine washable, (2) hypoallergenic, and (3) costs less than most other down pillows. But there are some doubts about its durability? There is a slim chance that the pillow may flatten under the weight of the sleeper’s head. If that happens, you will not get the neck support you wanted. Thanks to its thick gusset, the Beyond Down Gel Fiber Side Sleeper Pillow can help those with a strong pain in the neck. However, you might want to check whether it suits your neck and body, besides taking into account its small possibility of flattening, before buying it. The Talalay Latex Zoned Pillow is also a good choice for side sleepers. The pillow uses a special zoned technology and a pin-core design, both help ensure that your neck is nicely cradled and your shoulders and neck firmly supported. Another good feature is that the pillow keeps adjusting according to your body movements, providing maximum comfort. It is also quiet resilient and doesn’t require consistent fluffing. Those who are hypersensitive to allergens will appreciate its hypoallergenic pillow while environmental warriors among you will love the fact that it is made of 100% natural material. Some people, however, may find the pillow too thin for their liking. If you like a really thick pillow under your head, you might want to double check the pillow’s thickness. Also keep in mind that while the pillow is resilient, if it thins out even a little, you will not be able to fluff it. This is because latex always returns back to its original shape.